Prime Minister Narendra Modi delivering the keynote address at the Singapore Fintech Festival, in Singapore on November 14, 2018. Prime Minister Narendra Modi on Wednesday said India and Singapore are working to bring Indian and ASEAN small and medium enterprises (SMEs) closer. Speaking before a gathering in his keynote address at the Singapore Fintech Festival (SFF) in Singapore, the Prime Minister said that India and Singapore are working to connect Indian and ASEAN small and medium enterprises, anchored on an Indian platform, and expand it globally. In his speech, he stressed that technology today is creating immense opportunities to transform millions of lives and said that there is an explosion of fintech innovation and enterprise in India and the nation is "your best destination". "This has turned India into a leading fintech and startup nation in the world. The future of fintech and Industry 4.0 is emerging in India. 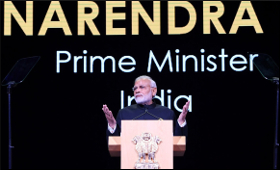 I say this to all the fintech companies and startups -- India is your best destination," Modi told the gathering at the Singapore Fintech Festival here. "Financial inclusion has become a reality for nearly 1.3 billion Indians. Technology today is helping them define competitiveness and power in the new world, added Modi, the first head of government to deliver the keynote address at the world's largest financial technology festival. “To increase your Venture Capital or VC funding by 10 percent, tell the investors you run a "platform”, not a regular business; If you want to increase your VC funding by 20 percent, tell the investors that you are operating in the "fintech space”; But, if you really want the investors to empty their pockets, tell them that you are using "blockchain”, Modi said adding that he have heard of this advice going around in start-up circles. "We are in an age of a historic transition brought about by technology," the Prime Minister added. Modi was set to present awards to winners of the first "India-Singapore Hackathon 2018" which aims to harness innovation potential of the youth from the two nations.